Republican John McCain said Thursday that as president he would appoint Alan Greenspan to lead a review of the nation's tax code - even if the former Federal Reserve chairman was dead. "If he's alive or dead it doesn't matter. If he's dead, just prop him up and put some dark glasses on him like, like 'Weekend at Bernie's,'" McCain joked. "Let's get the best minds in America together and fix this tax code." The 81-year-old Greenspan served as chairman of the Fed for 18½ years. Campaigning in early-voting South Carolina, McCain was asked about his support for a flat tax. "If the fair tax crossed my desk, I'd sign it. If a flat tax did, I'd sign it," McCain said while noting criticism of the concept. "What we all agree: It has to be made simpler and fairer." On another subject, McCain said he wanted Myanmar expelled from a regional group of Asian nations, calling the country's leadership thugs. He also decried China's inaction on its neighbor. "My friends, we should kick the Burmese out of ASEAN," McCain said, referring to the 10-member Association of Southeast Asian Nations. The nation's crackdown on protesters, including monks, has led to at least nine deaths and hundreds of arrests. "We should impose the most severe economic sanctions and penalties on them. 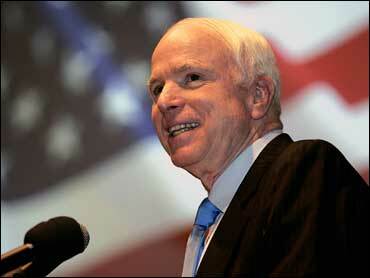 We should treat them as the pariah nation they are," McCain said as he wrapped up a three-day swing the state. "I'm disappointed in the U.N. and I'm disappointed that the Chinese are blocking action in the United Nations against them." McCain said he refuses to call the nation Myanmar because "the thugs that are running country changed the name of it years ago, so I insist on calling it Burma." McCain also told about 150 people at a Rotary Club meeting that torture is not the way to question suspects. His comments came as House Democrats demanded the Justice Department release two secret Bush administration memos that reportedly authorize painful interrogation tactics. The Arizona senator and former prisoner of war said "24" was one of his favorite TV shows, but he noted the main character shoots terror suspects in the kneecaps to get information. "That isn't the way it works. And I can assure you, I can assure you, that if you inflict enough physical pain on someone, they will tell you anything that they think you want to know to relieve the pain," he said. Later, in Washington, McCain railed against excessive spending on Capitol Hill - and the Democrats - as he spoke to Americans for Prosperity, an organization that says it champions principles of entrepreneurship and fiscal restraint. "We find ourselves at a time when the U.S. economy is weaker than anyone would like," McCain said to the friendly crowd. "Tough times can breed fear, and the Democrats are using those fears to push an agenda that is tired and dangerous." "They will tax, spend, regulate, and dictate for the benefit of special interests and partisan objectives," he added.